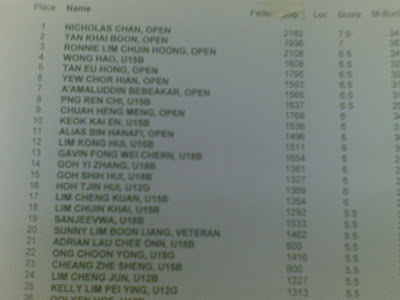 Last sunday(19/04/2009) i take part in Penang Chinesse Girl High School Open. Participant around 160. I finished 11th place, so sad because i missed to get a prize. 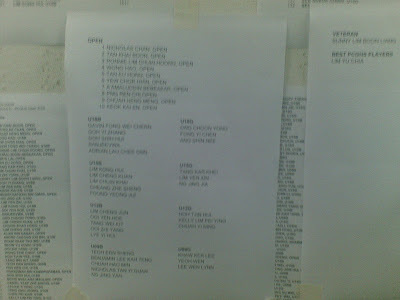 For open cateogory, prize only gived to 1st to 10th. I started this tournament with seeded 18th. I only lost to Chuah Heng Meng in Round 4 and Yew Chor Huan in round 6. Congrat to A'amaludin a.k.a ended7 because he managed to get top ten. Some good news is, PCA will organized Penang Open in June and this is a FIDE rated events. Also PCA try to find some more player age under 22 espesially from Penang mainland who can play chess well to take part in SUKPENS. For more details , can visit PCA official website at www.pca.bayanbaru.com. and 11th is me -Alias Hanafi.